The guru is not what I expected. His fabulous white mustache and thick ponytail of snowy hair are stark against his amber skin. Bhagavan’s young, lively eyes are animated, complementing his rich, British-influenced accent and almost flamboyant sense of humor. He laughs as he tells me about his deep experience with taekwondo. He smiles as he tells me not to worry about gaining weight while being here, and holds my gaze gently as he reassures me that I will begin to let go of the fears that drove my eating disorder. I leave Bhagavan, the spiritual master of Shri Kali, with a calmer heart. The storm is over. I will stay here for one month. I can make it that long. I have just locked my room when Manny, the Ashtanga teacher, knocks on my door. He invites me to go down to the beach with about ten or fifteen other people from the ashram. I throw on a bikini, and then join the group creeping down the ramp and out into the darkness of the night. The moon is yellow overhead as we cross the muddy path through the rice paddies across the ashram. I feel like a child again, giddy in a band of comrades. 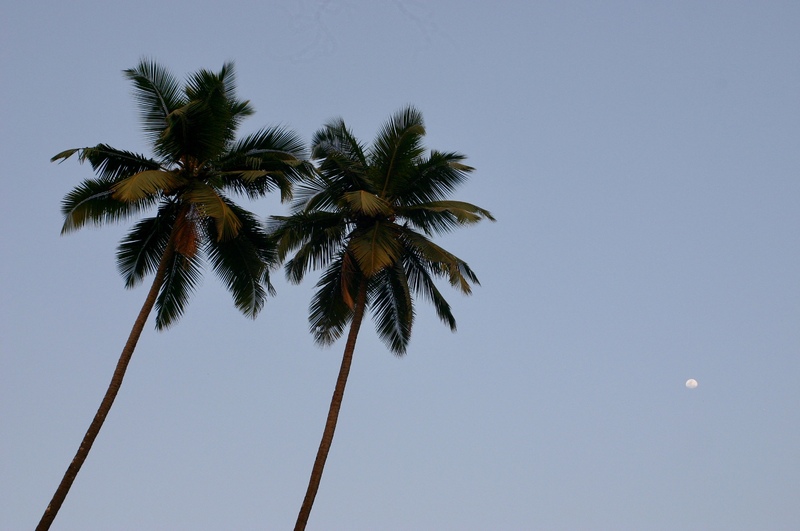 Ahead of us sway the coconut trees of Palolem; high and dark, they silhouette themselves in the night. Talking quietly, we tread underneath them as they sigh below wind and stars and sky. The back alleys of Palolem are quiet. Even the ferocious street dogs who patrol their lengths are silent. We thread our way through streets and sandy mazes and coconut trees until we find ourselves trickling onto the beach. The beach stretches wide and white under the kiss of the golden moon. We are louder here, stripping down into our bathing suits, leaving sandals and bags and towels in one big pile. Behind us glitter a few beachfront bars still awake; ahead of us lie the whispering, seething, rolling waves of the Indian Ocean. Moon overhead, we have abandoned all presumptions of quiet as we descend into the cool sea, so alive on our skin. Still a little hesitant, I swim out deeper and deeper to the more adventurous group farther off. I can hear my roommate-to-be, Jade, laughing a few waves away. I feel the ocean carrying me, a sweet sensation of being cradled in an endless expanse of movement, of endless life. We linger out on the deeper waves, enjoying the music of the sea dancing with the purity of our own voices. Suddenly the sky booms like thunder, followed by the hiss of a colossal kaleidoscope illuminating the sky. “Oh my god!” someone yells in disbelief. We are all astir with excitement as a frenzy of emeralds and diamonds and rubies spark above the beach, the rumbling crack! of fireworks accompanying the surge of morphing colors. This night is magical. After the fireworks end, we move closer to the shore. I find myself alone with Jade, who tells me to swish my hand under the surface of the water. “Watch,” she says. I do as she tells me, and gasp in wonder. As I drag my hand inches below the surface, a trail of glowing turquoise phytoplankton follow my movement. I move both my hands, stirring up the luminescent creatures. They twinkle against the dark silky depths of the water. I am caught between the stars of heaven and the stars of the sea, standing in two cosmos. I have lost all sense of time when we finally step from the waves and onto the beach. The night feels colder without the warmth of the sea, the land suddenly too still. Wrapped in towels, bearing flashlights, we trek back through trees and mud and pavement to the ashram. The magic lingers, painting my sleep with breathless dreams, sinking deep into the waves of my own body and mind and soul. For the first time in what must be years, I don’t feel afraid. Of anything. I am just here, allowing myself to plunge deep into the enchantment of life.